Medieval Kraków is one of most beautiful – and affordable – cities in Europe, well worth several days exploration and a great gateway into exploring the rest of Poland. 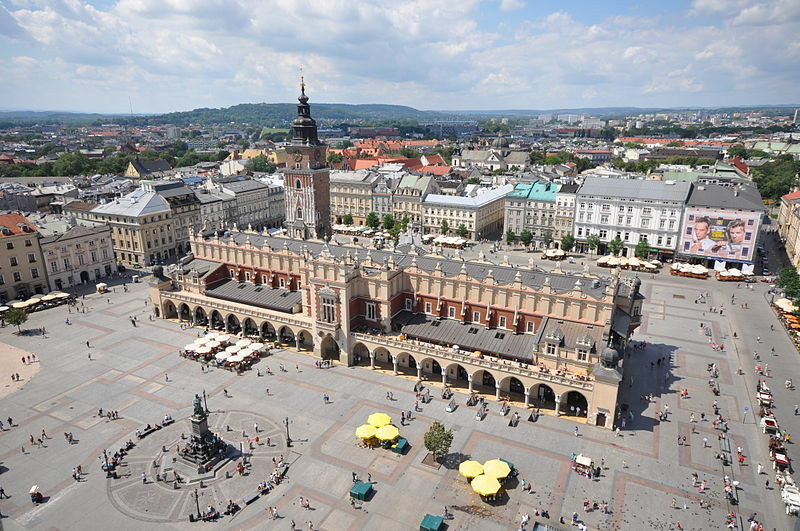 Here’s a comprehensive packing list for Krakow which will also cover you for travelling throughout Poland. Make sure you’ve got these essentials sorted well before your departure date. Flight Ticket – Make sure you’ve booked all flights well before your departure date. You may be required to show a return ticket when you check in, so print out copies of all of tickets. To get a the best value for money, compare flights online and book about three months ahead using a site like Skyscanner. Bus and Train Tickets – You can also make significant savings by booking domestic transport ahead of travel. Book the train directly from the largest national rail operator PKP Intercity or use the handy IC Mobile Navigator phone app. For more extensive travel, looks at Interrail Passes for EU nationals or a Eurail Pass for non-EU visitors. The PolskiBus network of coaches will almost certainly be the cheaper way to get from city to city. Warsaw to Kraków takes around 5 hours. Accommodation – Prices and availability fluctuate according to season but, as with transport, costs will be considerably cheaper if you book in advance. Use Booking.com to find the best prices. Passport – Ensure your passport is valid for at least six months and has plenty of blank pages. Also, get a passport cover to protect it from damage and provide a handy place to stash tickets in transit. Do I Need A Visa For Poland? – EU citizens, Americans, Australians, Canadians, and residents of many other countries do NOT need a visa for up to 90-day trips to Poland. See this official list for nationalities which do. These citizens should buy a Short-Stay Schengen visa for €60, granting visitors a kind of temporary EU status. What Do You Need To Pack For Krakow? You can get almost anything over the counter and Poland is a reasonably priced country, so the golden rule is to always pack less. Bigger supermarkets are open late, even 24 hours, and over the weekend. You can also rely on the Żabka chain of convenience stores from roughly 6am-11pm daily. You Don’t Need A Lot Of Toiletries – Toothpaste, mouthwash, shampoo, soap, razors, tampons, condoms, toilet paper and deodorant are available in every ‘drogeria’ at roughly the same price as the UK – look for a branch of Rossmann, Natura or Biedronka. There isn’t a particular likelihood of travel complaints like diarrhoea, but treatment for this (‘biegunka’) is available from a pharmacist (‘Apteka’). Polish weather can be unpredictable. All areas can be balmy in summer but rain strikes at any time of year. The best strategy is to pack layers in preparation. Bring four of five day’s worth of clothing if you’re travelling for a week or more. You’ll be able to do laundry twice a week and always have a spare outfit in reserve. You can head to cheap chains like Primark, if there’s something you’ve forgotten. Clubbing is a big part of Polish nightlife, so you may want to bring one outfit to dress up in. This is worth researching in advance. The clientele can be quite glamorous and you may get turned away if you don’t look the part. Upper body – Packing layers will give you the greatest flexibility in unpredictable weather. You can strip back to a light t-shirt in when the temperature is high or add a couple of long-sleeved tops when things get chilly. Under Armor t-shirts stay relatively dry and light. As with your legs, it’s best to keep arms covered if you’re out in the countryside. Base layer tops and thermal tights keep you warm in even the coldest weather, without taking up much luggage space. For men, Duofold sells excellent crew neck base layer tops slip on unnoticed under a t-shirt or long sleeved pullover. Duofold also has thermal shirts for women that provide excellent warmth without adding too much bulk. Underwear – I’ve found that Under Armor underwear, while pricey, has been invaluable for staying cool and also avoiding soreness if you’re doing a lot of walking. Another workaround for chafing is to apply some lubricant jelly, like KY Jelly, to your sensitive areas. You’ll thank me for this. A warm, waterproof coat or jacket is essential during the winter. Don’t skimp on this. It’s not a place to save a few pennies. Wear it on the plane to cut down on packing. A puffa jacket can be a soul mate for keeping warm. A good one, like the Columbia jackets with Omni Heat packs to nothing. I’ve never been cold whilst in freezing conditions. The Omni Heat feature is a shiny silver layer inside the jacket which helps keep you warm. Remember to buy your waterproof so that you can get a puffer or a sweater underneath. For the rest of the year, I carry a ‘cag in a bag’ in case of a downpour. Lower Body – Consider packing decent quality shorts, trousers, or skirts, according to season, that will deal with everyday travel and getting washed a lot. Go lightweight from April to September, and pack warmer materials during the other six months of the year. Pack at least one pair of light-weight trousers during the summer, especially if you’re out in the woods. This part of Europe is prone to tick-borne diseases. Sturdy zipper pockets on your shorts are also useful for protecting valuables. Cold weather calls for simple, durable and comfortable clothing. Pack a pair or two of jeans so that you’ve always got something warm, versatile, and good looking. The previously mentioned Omni Heat can also be found in Columbia reflective pants. I have never had cold legs wearing them. Otherwise I layer leggings on top of each other or leggings under other pants. Ski pants would work well too. Footwear – It pays to have good footwear to keep you comfortable and your feet in good condition. Check Amazon for men’s walking shoes and women’s. Make sure your socks protect your toes properly. During the summer, you might consider some lightweight, breathable Keen CNX hiking shoes. If you go with trainers or sneakers, make sure they have plenty of ventilation otherwise you’ll be prey to blisters, heat rash and other issues. For cold weather footwear, a decent set of hiking boots or snow boots, matched with some quality thermal socks will do the trick. Consider getting some snow grips for more mountainous adventures. Summer Accessories – If you’re travelling in high summer, a decent pair of shades will screen out harmful rays. You can find quality sunglasses listed on Amazon at reasonable prices. A hat or cap can be useful for keeping cool. Winter Accessories – Wrap up well if you’re travelling to Kraków for Christmas shopping or headed to Zakopane for a spot of skiing. Headwear – You’ll need a warm hat or beanie to keep the heat in and you should consider an ear warmer headband or ear muffs depending on your style. Scarf – You will also want something to keep your neck warm and, if you’re up in the mountains or particularly susceptible to cold, take a wind resistant balaclava to keep you cosy during the minus months of December and January. Sunglasses – A decent pair of sunnies is essential to protect your eyes from the winter sun, especially if you’re likely to be surrounded by snow which also reflects the sunlight. Make sure they provide proper UV light protection. Any quality brand like Ray-Bans or Maui Jim will do the job. Gloves – Mittens are warmer than gloves but clearly don’t offer the dexterity, so it depends what you’re doing. I have loads of different ones: fingerless, fingerless with a mitten top. Again, I layer for best effect. A good pair of hiking / outdoor gloves will work fine and some proper snow gloves. You can even get rechargeable heated gloves for outdoor winter activities. There’s also something special about popping a couple of hand warmers in your gloves to keep out the cold. You can buy packs of them by HotHands and Zippo do a fantastic hand warming variation on their classic lighters. Quick Dry Towel – Any hotel with en-suite bathroom will offer a fresh supply of towels, but bring your own if you’re using hostels. Super lightweight and non-bulky, one of these towels is a real godsend for travelling light. Sunland sells great towels that are priced fairly and small enough to fit into any suitcase or backpack. Refillable Water Bottle – Polish shops sell an array of bottled mineral water but, despite some native suspicion, tap water is absolutely fine to drink. It’s important to stay hydrated while travelling. Fill up a water bottle so you don’t forget. The Nalgene OTF is a great choice. Sunscreen and Insect Repellent – Summers can be very hot, so make sure you put on sunscreen if the sun is out. We recommend Neutrogena SPF 45 Drytouch Sunscreen, which is water resistant for up to 80 minutes and absorbs into your skin instantly. If you’re hiking or spending time in the country, insect repellent is recommended but this can be bought locally. Tissues – These can come in handy for a variety of emergencies, so keep a pack of tissues in easy reach. You can pick these up from any supermarket. Keep some hand sanitiser handy too. Antihistamine tablets – If you suffer from any kind of pollen allergy or have a generally sensitive nose, I highly recommend you take antihistamines. I’ve also found popping an antihistamine at the beginning of a long flight stops symptoms brought on by breathing canned air. They are cheap and available without prescription. Moisturiser – Keeping some moisturiser handy for your face whilst travelling can really boost your well-being at the end of a long day. My girlfriend got me using some quite posh products like CeraVe Moisturizing Lotion and Kiehl’s Ultra Facial Cream which genuinely feel a lot better than bog standard moisturisers. Ear Plugs – If you’re a light sleeper, ear plugs are an essential for journeys and essential if you’re sharing a dorm room. Moldex ear plugs are an excellent brand and very cheap too. Plug Adaptors – The only things I need to power these days have a USB cable and the Polish version of IKEA’s marvellous Koppla 3-port USB charger does the trick nicely. The key cities have a branch, so Google to see if there’s one within reasonable distance of where you’re staying. You can get a cheap lunch and use the wifi while you’re there. Poland mainly uses the same round ‘Type E’ plug as France. It has two round pins and a hole for the socket’s earthing pin. It shares the same 230V / 50 Hz power as the UK, but if you’re travelling from the US, you might need an adaptor with a build-in voltage converter for things like hairdryers. The simplest solution is to get a universal power adaptor, preferably with surge protection. Make sure you have a suitably rugged case. Otterbox provide some excellent Defender cases which can render your cellphone invincible. Take a power bank as you’re less likely to be around a power point whilst travelling. Make sure your travel insurance covers your cellphone as a specific item. World Nomads, for example, let’s you pay a bit extra to insure expensive item for their full value. A lot of travel insurance, by default, only pays out a certain limit for high value items, so check the policy carefully. The most valuable thing about a phone is what’s stored on it. Make sure that you have cloud access to backup your photos and data. Or back everything up onto a laptop if you’re bringing one with you. Don’t forget your phone charger! The bigger Polish cities have a branch of Saturn or MediaMarkt that sell replacements, but it’s an inconvenience when you could be doing more interesting stuff. If you will need to buy a local SIM card and your current handset is still locked to a provider, buy a cheap phone for the trip. Noise-cancelling headphones – If you expect to be listening to music en route, consider investing in noise-cancelling headphones. They are more expensive than normal earbuds but can be worth it on a long flight or bus journey for blocking out your surrounds. Camera – If you’re looking to take a lot of photos, you may still want to take a standalone camera. I’d recommend the Canon Powershot range which are super compact, easy to use and quite cheap. The other popular alternative is a GoPro, a tiny rugged waterproof camera which is great for recording first-person viewpoints while you’re doing adventure activities like climbing and kayaking. Whatever camera you use, be sure to bring plenty of memory cards to store all the images. You should regularly change the cards and backup the images immediately. Kindle – A Kindle reading device can be a godsend during downtime in places like airports. You can store thousands of books on an extremely lightweight device and avoid straining your eyes. Poland has a rich and idiosyncratic literature, and it’s difficult to recommend individual titles. But, Bruno Schulz – often likened to Kafka – is a big favourite of other writers. Start with ‘The Street of Crocodiles’. Stanisław Lem wrote brilliant science fiction. ‘Solaris’ is the most famous but most of them are good. My favourite contemporary author is Andrzej Stasiuk. Irvine Welsh was a fan of his ‘existential crime novel’ ’Nine’ but the most beguiling for me is ‘Tales of Galicia’. Don’t forget your Kindle charger and cable to power up. Polish Phrasebook – Around 30% of Poles speak English, often to fluency. However, the excellent ’Lonely Planet Polish Phrasebook’ can be a great help in emergencies. Journal – Whilst it’s great to keep a record of your travels online, a written journal is a handy place to sketch what you see and to stuff full of flyers, and other paraphernalia. Any old journal will do, but I have a weakness for Leuchtturm1917. They are not cheap but the small details make all the difference. Student Card – If you’re a student (or under 30 or a teacher), make sure you get an International Student Identity Card. This will entitle you to a bewildering array of discounts, including guidebooks, STA travel, and cheap entry. Driving Licence – You shouldn’t have any problems using a foreign licence in Poland, as long as you are over 18 with a full licence and have never been disqualified. You are required by law to carry the original registration and ownership documents, as well as insurance papers. Poland has one of the highest road fatality rates in Europe and the police are particularly strict with drivers under the influence of alcohol. Document Scans – Take cellphone photos of your passport, credit cards, insurance information, and any other documents, then save them as JPEGs to your online email account like Gmail. This way, if you lose any of your documents, you have copies available on your phone and anywhere with an internet connection. Also keep a list on your phone and in your email account of the contact details of banks etc that you need to cancel. Backpack or Suitcase – Invest in a decent brand like Osprey that can hold all your stuff comfortably without crippling you. Make sure the harness on the pack is going support the weight you’re carrying and the weight should be supported on your hips rather than your shoulders. See Amazon for bargain priced backpacks. For suitcases, make sure you have high-quality luggage that’s large enough to fit your gear and provide some extra space for anything you buy during your holiday. You’ll need a daypack for general day-to-day use. Travel Cubes – Investing in some travel cubes will save you time and hassle. By grouping all your clothes into three or four cubes, you can rapidly pack and unpack, rather than emptying a mess on the floor. If you’re strapped for cash, you can do the same with Ziploc or even carrier bags. Get different colours to tell them apart. Wash Bag – A decent, waterproof pack to store all your toiletries is essential. Pick a well-designed one that opens up to let you access just what you need, and that’s also durable enough to stop any leakage if your toothpaste makes a break from the tube. The Magictodoor travel kit is a thoughtfully designed and inexpensive example. Since most airlines have a 100 mL limit on liquids, pack large bottles into your checked luggage or transfer them into smaller containers before you pack your day bag. Luggage Locks – An inexpensive purchase, but worthwhile to keep your bags firmly zipped shut and away from opportunistic tampering. If you are travelling to and from the USA, make sure they are TSA-approved locks. Travel Wallet – A good quality travel wallet will keep cash, credit cards and important items out of harm’s way. We recommend the Lewis N. Clark RFID Security Wallet – big enough to fit your passport, cash and other essentials but still small enough to wear comfortably beneath your shirt. Since June 2017, EU citizens are able, by law, to use their existing phone and data plan in Poland. You should call your phone provider to make sure that your handset is enabled for roaming and to find out exactly what the extra charges are if you fall outside your plan. If you’re a visitor from outside the EU or need a new SIM for any other reason, you can get one in kiosks, supermarkets, and newsagents, but the best option is to go directly to one of the four big Polish providers: Orange, T-Mobile, Plus, or Play. A price war between them keeps prices relatively low. Orange offers good 4G coverage and speeds, and there is a branch in most major shopping malls. You’ll need your passport as proof of identity and the rep can recommend the most appropriate deal, set everything up for you, and activate the account in 10-15 minutes. At time of writing, Orange offered a SIM and 15GB data for just under €15, to be used within three months. But obviously, there are different tariffs for calls, text, and different data needs. Make sure you buy prepaid rather than a monthly plan. This wiki hosts an up-to-date rundown of all the main Polish cellphone providers. Free wifi is widely available in cafes all over Poland, just grab a coffee and ‘szarlotka’ (apple pie), and ask for the password – “jakie jest hasło do Wifi”. Plan B: head to an Apple Store or Starbucks. This is important! Make sure you have travel insurance with full health coverage, as well as the full range of activities you are likely to take part in, and any valuable items like cellphone or camera. World Nomads travel insurance is recommended by Lonely Planet and can be bought immediately online. Medical Insurance – Make sure your insurance includes comprehensive medical cover. Additionally, EU citizens should apply online for a free European Health Insurance Card (EHIC) which covers holders for reduced or free state-provided healthcare whilst in Poland, and should take care of any immediate bureaucracy. You can also install the smartphone app which will guide you through the whole process. If you’re a non-EU traveller, you should be sure to have contact details for your insurance provider (such as World Nomads) and understand what they require of you before leaving for Poland. Contact them as soon as possible for advice and keep any receipts to claim against. For medical emergencies, call 999 from a land line or 112 from a mobile phone. Vaccinations – Poland is a safe country and it is generally enough to be up to date with your routine vaccinations and an annual flu shot. Get your doctor or nurse to give you the all clear about 6 weeks before travelling. If you are planning to hike or camp in the north-east of the country, you should consider vaccination against tick-borne encephalitis. Prevention is the best cure, so be sure to cover exposed skin. Be sure to check the FitForTravel website for the latest travel advice. Prescription Medicines – Have a full supply of any prescription medicines you need, in the original packaging with prescription label and sealed, if possible. Or take written documentation to present at customs. Non-Prescription Medicines – You can get over-the-counter medication from a chemist (search for ‘Apteka’ in Google Maps to find one near you), but the laws are stricter in Poland and many painkillers are only available with a prescription. If you think you’re likely to need any non-prescription drugs, you might want to bring them with you. It can save trouble with customs if you keep these sealed in their original packaging. Allergy Card – If you have any serious food allergies or can’t eat certain foods due to your beliefs, make sure you have a translated statement that you can show to food vendors and restaurants. Select Wisely sells downloadable cards for most major food and drug allergies in a huge variety of languages. Despite being a member of the European Union, Poland’s currency is the złoty, abbreviated to zł or PLN. Visa and Mastercard debit and credit cards are as widely accepted in Polish shops and ATMs (‘bancomat’) as almost anywhere else in Europe. American Express not so much. Cash machines don’t usually carry a usage fee, especially if you stick to the main banks. If your bank charges a flat fee, get a large wodge in one go. If offered, withdraw in the local rather than your home currency. It’s cheaper. You will need your PIN number for all uses. Always inform your bank before travelling and check that your cards will work internationally and check whether your bank is partnered with a Polish equivalent, as these often carry a better exchange rate. If you’re having problems, try at a couple of different banks first, then call the number on the back of the card and you should be able to get it unfrozen. I’ve also found it prudent to carry a back up card from a different account. The cheapest option is often to bring some cash and change it once you get to Poland. Exchange offices (look for ’kantor’) are competitive and often don’t ask for commission. Wait until you’ve left the airport and get to the city. Make sure they advertise two rates (buying and selling) and confirm any transaction fees upfront. If you’re in Krakow, I’m told Slawkowska Street is the place to go. Try the tourist information in Warsaw Old Town. Change a lump sum for a better deal. This also serves as backup in case something goes wrong. Poland’s climate is temperate and, due to its location, is subject to opposing forces. Warm weather comes in from a south-westerly direction and the cold blows down from the north. These make things changeable. In general, though, the winters are cold – roughly -2ºC in Warsaw and 1ºC in Krakow, between December and February. Between June and August, the temperatures reach an average high of 23ºC in Warsaw and 24ºC in Krakow. The twist in all this is that Poland sees dramatically higher rainfall in summer, so the best time to visit is arguably the cooler, drier spring and autumn months of April, May, September, and October. Poland Guidebook – A guidebook is still the easiest way to get an idea of all the options available to you. It’s worth getting a few months before your trip so you can really thumb through and highlight the stuff you’re interested in. ’Lonely Planet Poland’ would be my personal preference, but there are numerous other guidebooks, including city and region-specific titles. I use my guidebook as a journal, making notes in the margins about where I went and when, and what discoveries I made of my own. Polish Maps – You can usually pick up free street maps in most tourist areas. Grab a few from where you’re staying and tourist information centres, as each is likely to be selective. If you have cellphone data to spare, you should also consider using Google Maps. You can download maps for offline use, potentially saving on data. I’m partial to the Krakow PopOut Map, but you might want to check it out in person, as some people find the print too small.